This is really table-tennis competition at the highest level. Even at events like the Olympics and the Worlds, you don’t see match-ups such as the ones in this match. Our opponents are the strongest players in the world, and the Ma-Samsonov and the Liu GZ-Boll matches are very impoortant. These players are young, and will be top players for a long time. They have not played each other much, so the results here will have an effect on their confidence when they meet later. If we win the event, that would be another Chinese victory over the rest of the world. For the foreign players, beating the Chinese is the goal. We will all be fighting for our honor. It’s not easy to predict results. The two sides are evenly matched, so it will come down to execution on the court. I will be facing Saive. He is the strongest-willed player in the world. He always maintains a high level of intensity, and he never gives up. He has very finely-honed skills, with few weaknesses. He has beaten all the top players. We have met perhaps 6 to 8 times in the past, and I have the higher winning percentage. After the change to the big ball, Saive’s level has risen up. This year I have also been playing better. This should be a 50-50 match. It’s hard to say whether we have a good draw. Nonetheless, this will be a very exciting match. I have roughly a 50% chance of winning. I hope this will be a great match, and I think there will be a lot of fans there. To be able to play against a great player like Liu Guoliang in his final international match will be an unforgettable experience. When we learn that my opponent is retiring, we all feel a little old. 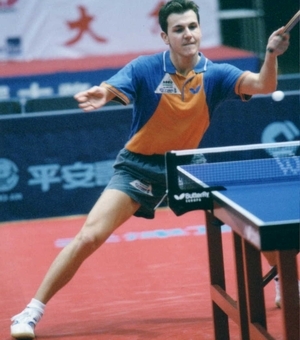 Liu has a great career: Olympic champion, world champion, world cup champion, and so many other titles. He has won all the titles in singles, doubles and teams. In the early ‘90’s, when the Europeans were ahead of the Chinese, Liu led his teammates back to the top. We hope that the fans and the organizers will create an memorable night for Liu. My draw is not too bad. Every one of the Chinese is so tough! Liu Guozheng is tough, but I think I have a chance against him. That’s the case in general: every one of us (international team) has a chance against our Chinese opponenet, but we could also lose. We hope we will win! 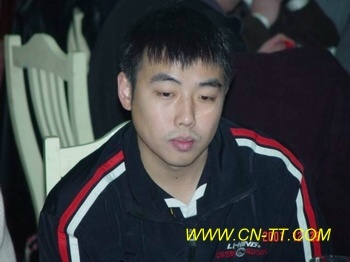 About 3 or 4 years ago I played against Liu Guozheng. He was playing a little tight, but he was very lucky in that match and won. He had a very strong forehand, and he received serves very well. For the fans, this will be a very exciting and interesting match. I am very happy that this match is being held in my home city Wuhan. This is the highest level of competition in the world. 9 of the top 10 ranked players are in this event. I have only played once against the German player Boll. That was in 1998, and I was playing for the French club. Boll was playing for a German club. I beat him 2:0 then, and have not faced him since. Boll has been playing very well, and achieved great results. I will be well-prepared against him. Looking at the draws, no team has a clear advantage. Basically it’s 50-50. I hope I can play my best to help our team win.